PRIMITIVE MYSTERIES (1931) recreates the world of Indian villages that dotted the landscape of the American Southwest, flourished on vast open plains, and surrounded by majestic mountains. Catholic rituals introduced by the Spanish conquerors became interwoven with the beliefs and ceremonies of indigenous American peoples. The Miracle Play was transformed from an allegory of traditional faith into an expression of the primitive vitality of the new world. 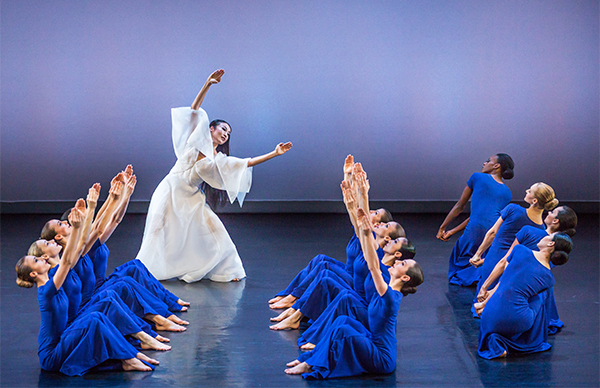 Performed in three sections, Hymn to the Virgin, Crucifixus and Hosanna, the dance evokes a succession of religious images: the pieta, the crucifixion, and the assumption. Each section begins and ends in silence with a measured processional as female celebrants, framing a solo figure, establish the sacred space. They walk in unison, feeling each other’s heartbeat, instruments of a divine power. The dusty earth beneath their feet and the hot sun beat down upon their backs as they come together to enact this sacred ritual.